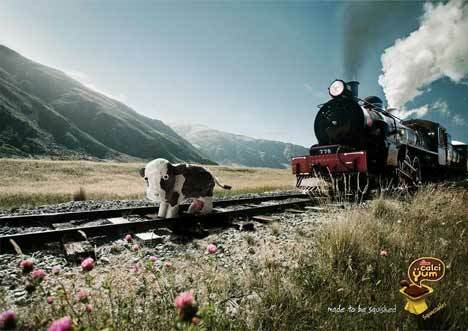 New Zealand’s new dairy product, Swiss Maid Calci Yum Squeezables, was launched with a print and television campaign presenting four scenarios in which a mouldable Friesian cow might be squished: on the tracks in front of a steam train, in the ring with a stunt wrestler, on the ground in front of a steam roller, and on the end of a line of cars waiting for the descent of a Big Wheels stunt vehicle. This spot was filmed on the Kingston Flyer line, between Kingston and Fairlight. The Kingston Flyer is New Zealand’s famous vintage steam train, based in Kingston on the southern shores of Lake Wakatipu, a 40-minute drive south of Queenstown. The Flyer’s history spans over 125 years and it still departs Kingston Station two times daily during its running season (beginning 1st October through 30th April). As a boy I remember the Kingston Flyer in my home town of Winton, on it’s way between Invercargill and Kingston during the 1970s. The line between Invercargill and Lumsden was eventually pulled up and sold for scrap. See the Wikipedia article. This spot was filmed in the Cardrona Adventure Park, in the hills between Queenstown and Wanaka. 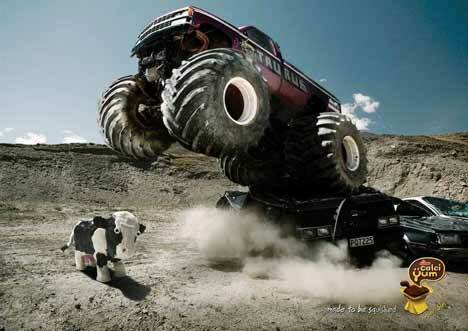 Ian Soanes, the Park’s residential stunt artist from South Africa, drove the USA Taurus over several vehicles, crushing them in the process. All part of the deal! The Calci Yum Squeezable advertising campaign was developed at Colenso BBDO by creative director Richard Maddocks, copywriter Jonathan McMahon, art director Lisa Fedyszyn, and agency producer Richard May-Smith. Filming was directed by Luke Savage via Flying Fish, Auckland, with producer Anna Stuart, executive producer James Moore, and director of photography Duncan Cole. All was shot using a Panasonic Varicam. 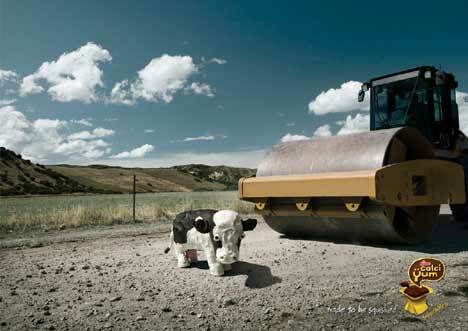 The cow was shot on green screen in ‘real motion’ as the finished cow was picked apart and the footage then reversed and sped up in post to achieve the stop motion effect. Ken Sparks was the offline editor and Puck Murphy at Perceptual Engineering did the online. Voiceover was provided by John Leigh, known in NZ for his role as Lionel Skeggins in Shortland Street. Photographer was Jonathan Pilkington. Retoucher was Berrin Moody.